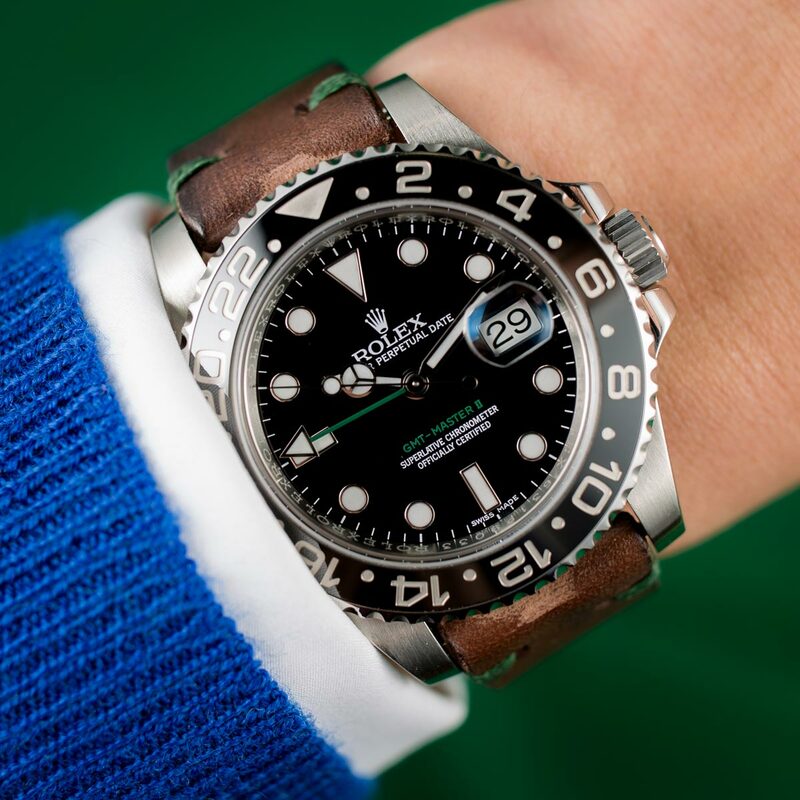 Rolex’s range of bracelets are subjected to all the same stringent criteria of innovation and flawless engineering as the watches they are attached to, and have names almost as universally recognizable. Adding a leather strap to your Rolex is an easy way to change up the look without spending too much money. The Oyster bracelet is perhaps the most synonymous with the brand, gracing the majority of the company’s sports offerings with a design that has followed Rolex’s philosophy of relentless refining since it was introduced in the 1930s. It is the perfect accompaniment to the rugged, robust nature of the professional tool watches; sophisticated in its simplicity and built to last a lifetime. 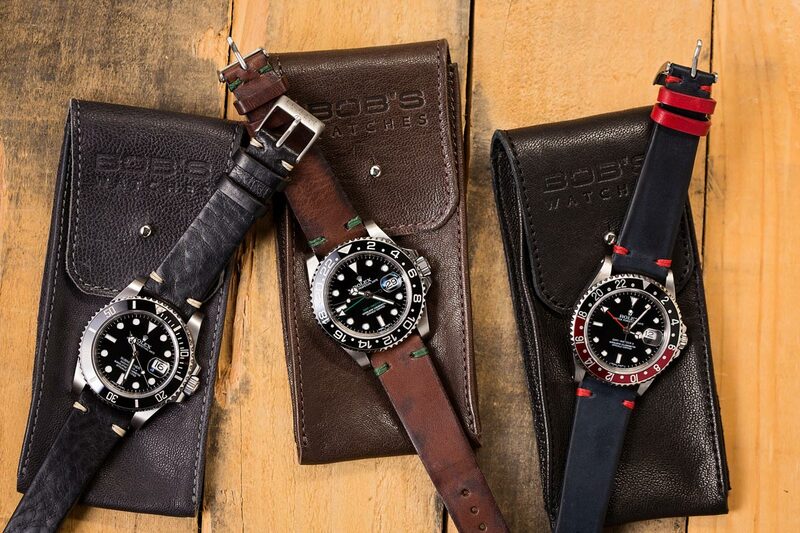 For those wanting to bring a new versatility to the standard look of their watch, there are a number of manufacturers supplying leather straps designed to fit the Rolex range. 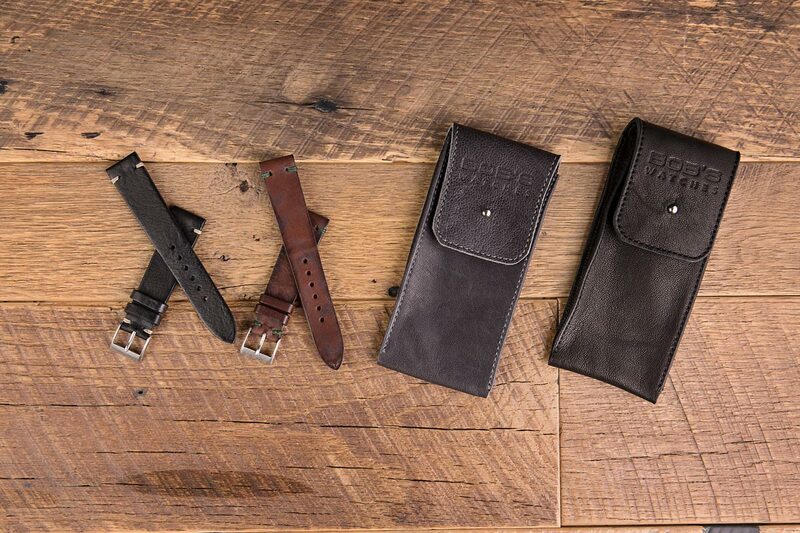 Watch accessories like leather straps are commonly forgotten, but they can change the look of your watch instantly. Swapping out a metal bracelet for a leather band completely alters the overall appearance of the watch and communicates a whole new message. A black strap can add a more formal, sober aspect to an otherwise utilitarian exterior. A colored strap can be used to match the different accents on a watch’s dial and bezel, creating a more coordinated look. Changing a strap is common and it purely up to preference whether you want a strap or not. As well as allowing you to differentiate yourself by putting your own stamp on a classic design, substituting a metal bracelet for a leather band has other benefits. The 904L steel used in all modern Rolex bracelets, while incredibly durable and corrosion resistant, has a significant weight to it. Coupled with the already hefty quality of the watch itself, the much lighter leather alternative can make your daily wearer a more comfortable proposition. The pliable nature of the material is also a valuable factor. Like a leather jacket or pair of shoes, a leather strap will eventually conform to the shape of the wearer, making it uniquely, and snugly, your own. And they also avoid the one major disadvantage shared by all metal bracelets, regardless of how resilient the steel involved; sagging. A regularly worn bracelet will eventually stretch over time, leaving a once perfectly fitting watch loose and sliding on the wrist. Get high-quality leather straps for your watch. Recently, we outfitted a number of our favorite Rolex references, old and new, with a selection of the beautiful leather bands handmade exclusively for us in Italy and available through our website store. Check out the results of our photo shoot below. Our black leather strap with red stitching found the perfect compliment in the original GMT-Master II, the Fat Lady. 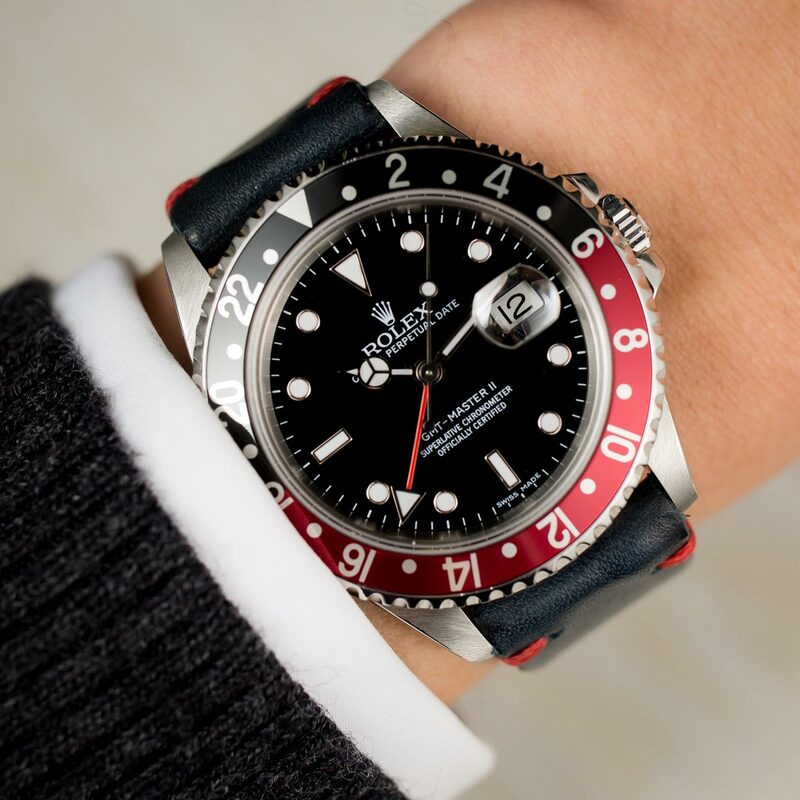 The Coke bezel’s color scheme, the first time Rolex had produced a watch with that combination, along with the bright red 24-hour hand, echoes the colors on the strap nicely. Available with either a gold or silver buckle, we chose the silver to mirror the brushed steel on the watch’s lugs. 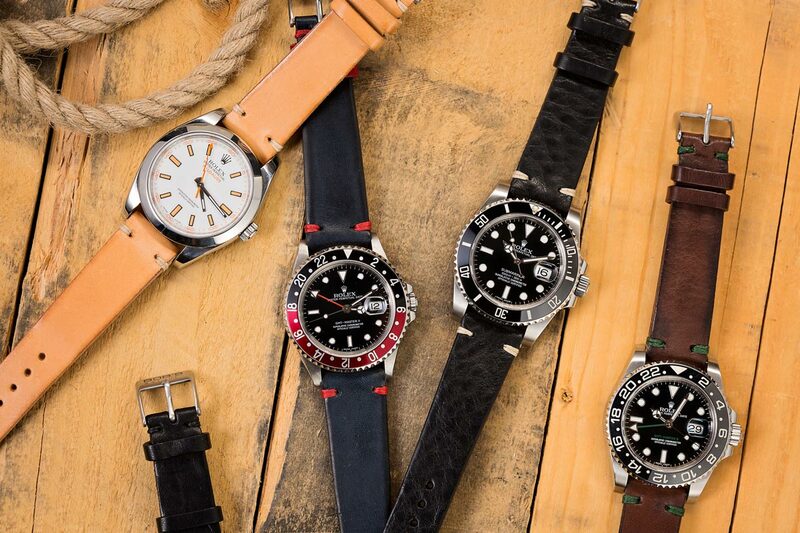 Unlike many after-market manufacturers, our leather straps are designed to fit vintage examples of Rolex’s most iconic creations, as well as the latest versions. The Coke looks amazing with the additional hints of red. The first of the Cerachrom bezel Subs, the 116610 appeared in 2010 and carried on the tradition of the world’s favorite dive watch. Replacing the original Oyster bracelet lends a whole new identity. 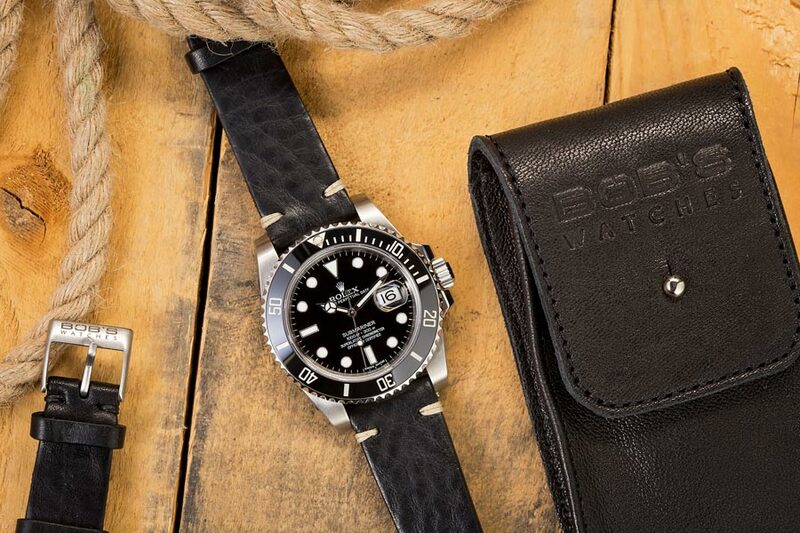 While this updated model retains the classic look of its predecessor, even with the broad shouldered lugs and thicker crown guards, fitting a textured, deep black leather strap gives it a tasteful, more modern style. Enhanced with subtle tan stitching that complements the bezel markings, it’s a beautifully understated example of one of the all time greats. You can extend black theme into the leather straps if you enjoy that tone. An underrated gem of the Rolex range and a big favorite here at Bob’s Watches, the hour indexes on this Milgauss ref 116400 harmonize perfectly with the light calf coloring on this supple leather strap. The white dial and sudden orange lightning bolt seconds hand have always made the Milgauss one of the most colorful in the lineup, and the addition of the new band makes it a particularly eye-catching example and an ideal watch for the summer. Sometimes a leather strap looks better on the watch than the original bracelet. 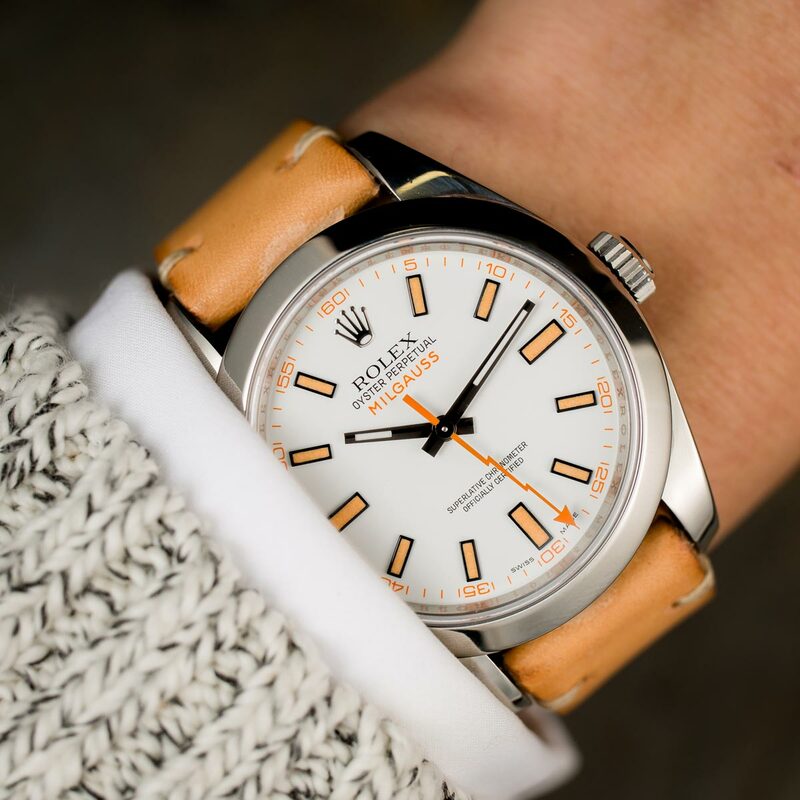 While the first of the Cerachrom GMT-Master IIs lost the traditional two-tone bezel, Rolex did manage to include a pop of color in the seconds hand and in the model name, sitting above the 6 o’clock index. The small flashes of green are also found in the stitching details on this dark brown, distressed leather strap that gives the GMT a more casual, dressed down look. One of the most versatile of the modern Rolexes, the GMT-Master II remains as adaptable as ever. The green 24-hour hand matches the thread that was used. Customizing your Rolex with a leather strap is an easy and cost-effective way to shake up your style and set yourself apart. You can even keep a range of different colors to pick and choose as the mood and environment changes. 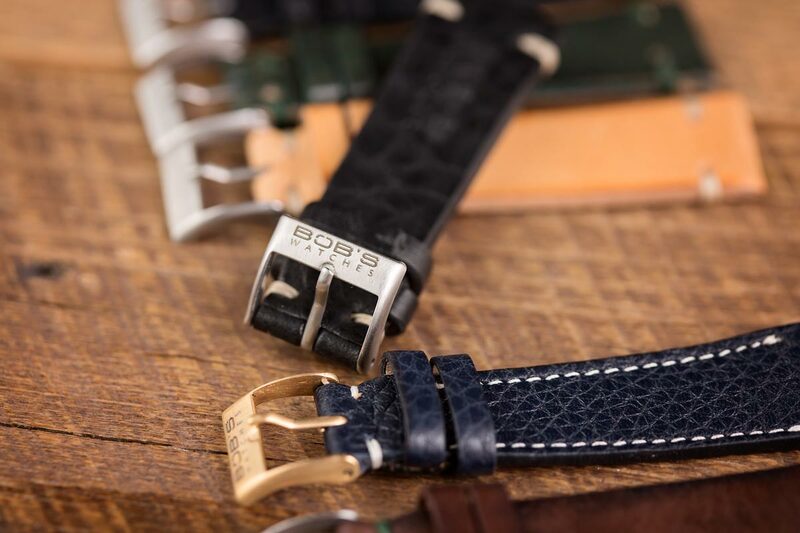 There’s no shortage of aftermarket options, but for straps of the highest quality, hand-stitched with an impeccable finish, make sure to check out the range in our store.